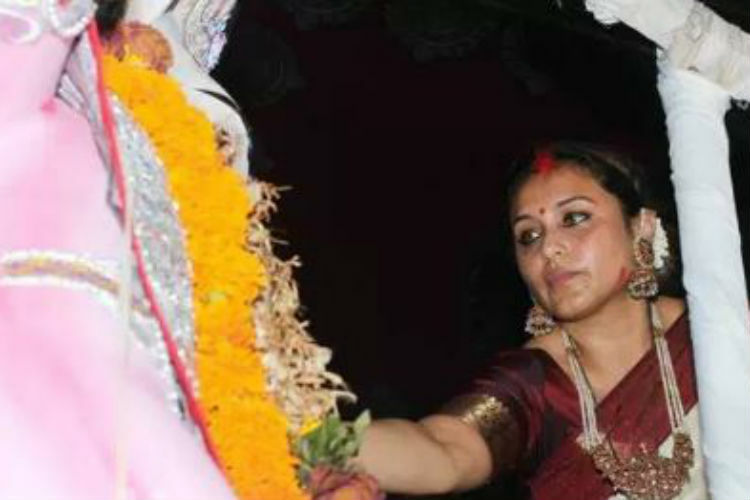 Bollywood actress Rani Mukerji celebrated the ‘Durga Puja‘ and ‘Dusshera‘ with family and friends. The actress took part in ‘Sindoor Khela‘ at North Bombay Sarbojanin Durga Puja Samiti. Rani, who was till now busy looking after her new born baby Adira, took some time out and was seen in the festive mood. She went to celebrate the festival first with Kajol and then with family members and other friends. 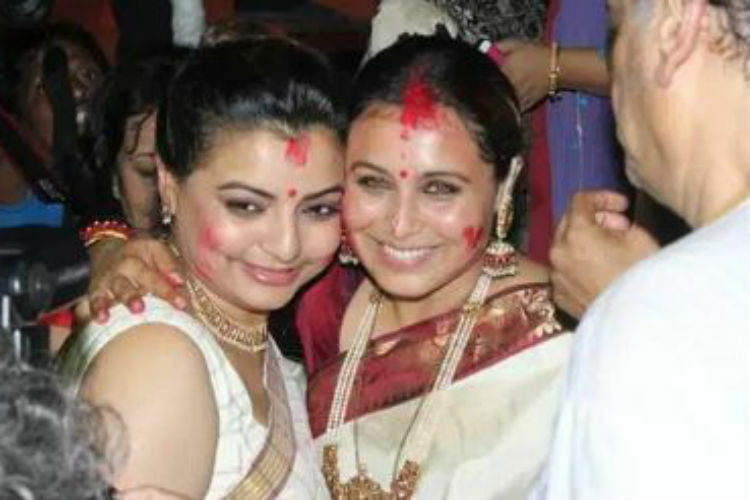 Dressed in a white sari with a red border, Rani looked elegant. The actress has also lost some weight.She was seen spending some quality time with choreographer and good friend Vaibhavi Merchant. The actress who has taken a break from the movie is giving full time to her daughter these days. To see her attending the event was a delight for all the fans. Rani Mukerji and her baby Adira have been under constant media scrutiny. While the fans, as well as the paparazzi, tried everything to catch a glimpse of actress’s adorable daughter, Rani Mukerji is making sure that the baby remains well guarded. A few month’s ago a photograph circulated on the social media which claimed to be that of the actress and her daughter. However, a statement was issued from Rani’s side that she is not on social media. The statement stated that all the existing accounts in the name of the actress are fake. It further stated, ” This is to inform you that Rani Mukerji is not on any social media platform and has never been. There are several fake accounts that keep cropping up. We would like to request you to not pay any heed to them or the content they put up as it is all fake.” Rani got married to director Aditya Chopra in April 2014 in Italy. Their daughter was born in December 2015. Rani Mukerji is enjoying her motherhood and is spending quality time with her daughter. Last seen in ‘Mardaani‘, the actress has decided to take a break for the time being so that she gives her full attention to her daughter. It was only a few months ago that the actress was seen vacationing in Paris alongside hubby Aditya Chopra. Rani’s husband Adi was busy shooting for his directorial venture ‘Befikre‘. As per the rumours, the scripting of ‘Mardaani 2‘ is still undergoing.